* ... TEAGARDEN IN AT KARPE: It looks like Tom Teagarden is the new president over at Karpe Real Estate Center, succeeding Ray Karpe who abruptly resigned last week. Teagarden is a longtime Karpe employee and local product who has worked with the family company for years. He told me that he had been out of town and wasn't even aware that Ray Karpe had resigned, and when he returned Bob Karpe (Ray's father) offered him the job. (In an earlier post I erred in saying Bob Karpe founded the firm. It was actually his father, Elmer) Nobody is going public on the rift between Ray and his father. Ray says only there was a difference of opinion on the company's strategic direction. Teagarden was born in Bakersfield, graduated from Garces Memorial High and later UC Santa Barbara. He moved to Virginia where he worked, moved back and began working at Karpe in 1989. He's been married for 35 years to Susan and they have three grown boys, Thomas, Adan and Matthew. Here's wishing him and the company success. "At times, I have seen three or four vehicles at one location with expired tags. A couple of years ago I tried to find an agency to call or report this information to: CHP, city police, sheriff's department, Department of Motor Vehicles... none of these agencies were responsible... an individual has no way to report these vehicles. How many millions of dollars is the state missing from expired tags?" Yet another correspondent (who asked me not to use her name) speculated those driving around with expired tags are the same people who regularly fail to pay library fines or their student loans, and then are shocked when it negatively impacts their credit. "This is a blase attitude that I have noticed for all the years we have been living here," she said. * ... A DOWNTOWN RENAISSANCE? I had a nice chat the other day with Cathy Butler, head of the Downtown Business Association (DBA), who was absolutely giddy over what is happening downtown. She was raving about the new restaurant Victor Victoria's over on 19th Street, located in the same spot that once hosted Kosmo's and Goose Loonies. She also mentioned the new "O" sushi restaurant (owned by the same folks who run Toro sushi over at the marketplace; read the previous post here) and of course she's excited about the opening of the newly renovated Padre Hotel in six weeks or so. Bringing downtown Bakersfield back to life is a block by block project. 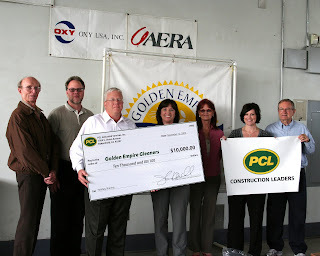 The old central business district has come a long way and has an equally long way to go, but these developments are worth celebrating..
* ... PCL MAKES A DONATION: I mentioned earlier the generosity of industrial services company PCL donating $10,000 to the Golden Empire Gleaners. Here's a picture of the check presentation, never a real compelling picture but these folks deserve some recognition. From left to right are Jim Blom, Todd Yepez, John Kerchinski (PCL president locally), Pam Fiorini, Pam Lindaman, Renee Massey and Ronald Eaves. Thank you for pointing out good things happening in our community. There is enough negativity and it's nice to see you recognize people doing good things. I'm not one of those who is defensive about our town (God knows we have our problems) so I appreciate a little balance. Thank you. The new Enso sushi restaurant is lovely but that block of 19th Street is the pits. I wouldn't go there at night.